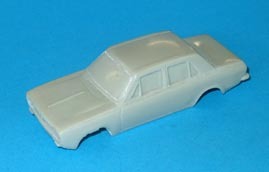 Main thing on the bench at the moment is the 60s Hillman Hunter. Main body shape done and awaiting lights/bumpers/trim detail. I'm hoping to have alternative grills for the Minx, Vogue and Gazelle variants. 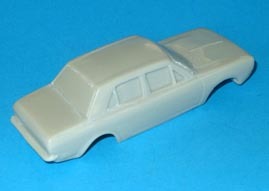 Once finished a fastback Sunbeam Rapier/Alpine/H120 shell will be attempted based on this. I say attempted because there is very little pillar area on the fastback so may prove too difficult. This started life as one of my Avenger shells, stuff was added or removed untill the correct basic shape was acheived, as here. At various points it looked like a HB Viva, then a MKII Cortina, its amazing how similar the basic shape of most late sixties saloons where (some things don't change then). This is what I call a file save version, there comes a point in the construction of a scratchbuilt shell where you have to think "hold on, I've done quite a lot now and some of its pretty fragile, if I carry on there's a risk of buggering it up" so I take a silicone mold and cast a copy. This works out expensive in silicone but it does mean you get a one piece model to work on, and if you do bugger it up you can cast another one rather than start again from scratch. Rear arches have already been reshaped but the fronts are a little large so will be done too. Its at the fun stage now, most of the hard stuff has been done and it is only interesting stuff like scribing panel gaps, making lights, door handles, trim etc all of which make it come alive.